Although the Spragg name became very familiar in Mobberley, it was George (above) who came to the village having been born in Shropshire. He hadn't had an easy life and his mother, unmarried at the time but using the name of the father of her children (Thomas Carter), was in the workhouse in Church Stretton in 1861. She did eventually marry Thomas in 1870. George Spragg must have moved to Mobberley sometime before 1884 when he married Elizabeth Pearson in 1884 at St Wilfrid's. 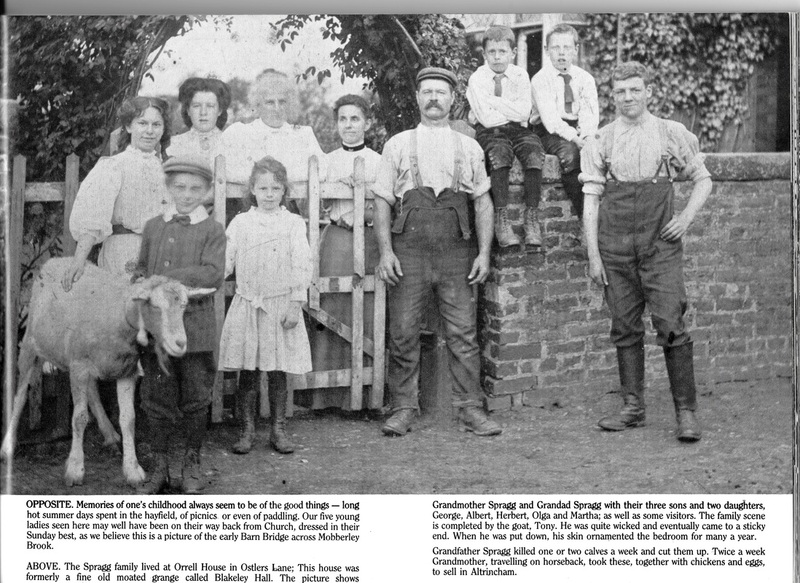 At the 1891 census the family are at Bleakley. George and Elizabeth had seven children; Albert who married Annie Ravenscroft in 1916, George who married Beatrice Starkey in 1914; Martha Ann, Charles, Olga Miriam who married Thomas Broad in 1920 and Herbert Ivanhoe who married Doris E Higginson in 1924. The family were at Bleakley in 1901 but by 1911 had moved to Mount Pleasant in Marthall. Colin, the son of Herbert and Doris lives in Sale and remembers growing up at 9 Hall Bank. Mabel, the daughter of George and Beatrice is still going strong, born in 1922 and living locally.